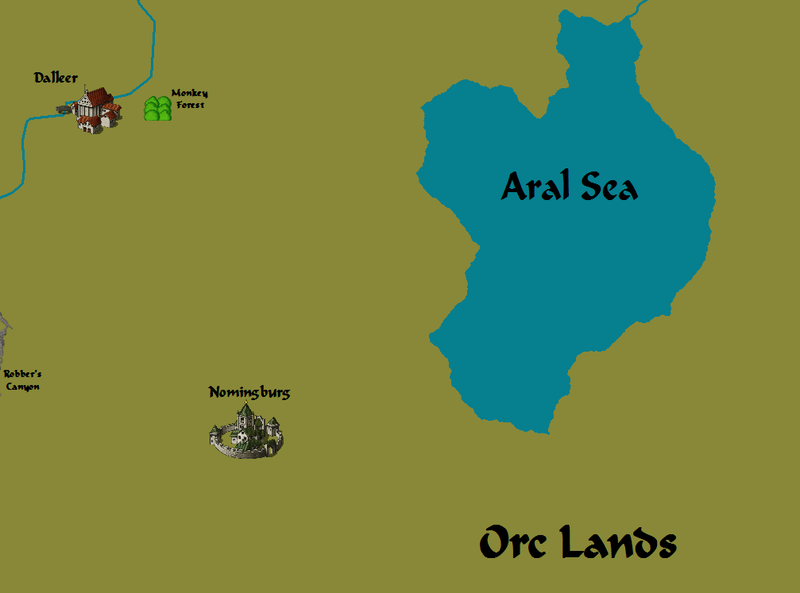 Nomingburg is a town of 70,000 people that was settled by Halflings and remains mostly inhabited by them. No roof in the residential area is allowed to be above five feet tall. Biglings have to live on the outskirts of town, in the commercial area, or in hotels. The most famous hotel, Hotel Nomingburg, is a staggering seventy feet tall and belongs to Toto the Half-Orc. While Hotel Nomingburg is in the commercial area, numerous requests have still been made to demolish the huge building. Duke Jingo has adamantly refused all such requests. Although Nomingburg appears like a nice, happy, Halfling town at first, it is in fact a nest for assassins. The best hired killers in the world live in Nomingburg. Ninjas, assassins, blackguards, blood mages, and even some Ix priests can be found in Nomingburg. The different guilds do not get along well with each other. More than a century ago the guilds spent most of their time assassinating each other in a desperate attempt to control the populace of Nomingburg. Power play followed power play and the situation threatened civilian life in Nomingburg as well as the structural integrity of the town itself. The blood mage’s guild had set off too many fireballs that caused a massive fire to rage through the city. The conflagration was only stopped by a combined civilian effort and the entirety of the blood mage’s guild and the blackguard’s guild using all their spell slots for create water. The chaos had to stop and one Halfling stepped forward to do it. The Duke Jingo is a Halfling who measures at almost five feet tall. He was a philanthropist and an assassin independent of any guild before the guild wars. He was simultaneously contracted by all sides to stop the war by any means. He tricked the uncompromising dons of each guild to meet without weapons. Diplomacy ensued and Jingo was declared Duke, representative of the town, and liaison between the guilds under the conditions that he never leave the town or complete anymore assassinations. The ninja guild has three divisions representing the three different classes that can join the guild, ninja, rogue, and monk. The ninja guild teaches reliance on one’s self instead of equipment, magic, allies, or divine entities. The main trainers are Devarel the rogue, Tichinewee the ninja, and Horho the monk. The don of the ninja guild is Hustreon. The assassin’s guild accepts almost everything that applies for membership under two conditions. An applicant must kill someone the guild specifies, no questions asked and the applicant must be able to hit vital areas of an opponent when that opponent is distracted(sneak attack). The leader of the assassin’s guild is a Doppelganger known only as the letter R.
The blackguard guild is an organization of evil fighters who serve many different evil deities including Ares, Hades, the Plagues of man, and the Titans. The guild is extremely selective, only allowing the most qualified and depraved people into the guild. A priest of Ares, Coneharen, controls the blackguard guild and who is admitted into its ranks. The blood mage’s guild is very small compared to the others, but just as powerful as it confines its members only to mages with far more firepower than a fighter or rogue. The blood mages are hired for large scale assassinations or something that needs to obviously be a murder. The requirements to get into the guild are more than most will bear. One must have gone to Tartaros and returned to the world of the living. This journey is not without its scars and many are entirely unwilling to do so. Very few willingly fulfill this prerequisite to become a blood mage. The don of the blood mage guild is Chinera, a Half-Elf who it is said has died an uncountable amount of times. Nomingburg is one of the only places in the world outside of Athens where poison is legal. Almost every type is bought and sold in this city. It pisses off the nearby cities greatly as they have worked very hard to outlaw its trade only to have a city within a few days travel legalize it. Nomingburg has an extensive sewer system to provide for its indoor plumbing. Many monsters live in the sewer system and Duke Jingo does not want to risk any of his staff in cleaning it out. Work for adventurers is readily available if they are willing to go running around in thousands of people’s filth. Nomingburg is mainly a farming town for its financial support. The assassin’s guilds try to stay out of the civilians’ way, and will protect them as much as they can. They feel that all the work they do is really to protect those farmers. An oath is required to enter all the guilds that the person will only murder if it provides for the people. This can mean murdering evil people or giving a portion of the reward money back to the public to compensate for the death of a good person.